At ground level, Gustafson Porter + Bowman’s landscape design for the public realm at New Ludgate seeks to tie the new development seamlessly into the surrounding urban fabric and character. This is achieved by fine landscape details and finishes which reinforce the smooth transition and facilitate the use of this new public space in a tight urban site. A small piazzetta on Old Bailey marks the entrance to a West-East passageway which links Old Bailey to Limeburner Lane. 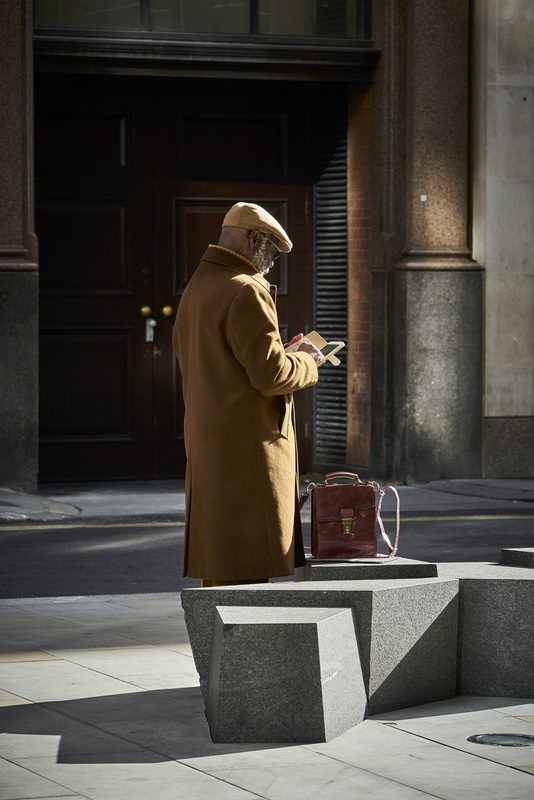 This new route recalls similar hidden passageways throughout the City of London which create unexpected shortcuts. It marks a transition from the traditional pavement of Yorkstone to a dark granite in the piazza and passageway. This change is made with a bold geometric paving pattern which takes inspiration from fashion designer Alexander McQueen and the 20th century artist M. C. Escher. The design and development of this paving pattern required close contact and collaboration with the wider construction team. Additionally, on the development’s fifth floor, Gustafson Porter + Bowman developed a large south-facing roof terrace which benefits from day-long sunlight. A dense planting scheme varies in height and corresponds to an understated colour scheme for pockets of the raised flower bed, which is wrapped in a sinuous white Corian bench. Both inconspicuous and sculptural, its form continues to wrap around the very edges of the terrace whilst its varied height creates ample soil depth. 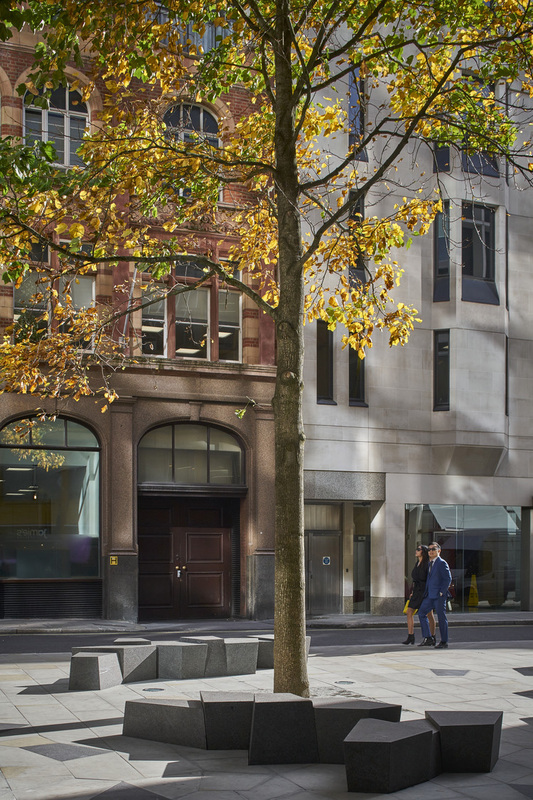 The design of the planting bed allows for two channels which aid spectacular views for the building’s users to St Paul’s and the City of London beyond. The planting on New Ludgate’s fifth-floor terrace is comprised of colourful bands of perennial plants mixed with ornamental grasses in loose, natural arrangements. Plants are grouped together according to colour and form. Bands of yellow flowering evergreen Euphorbias contrast with the tall blue flowering spikes of Erynginum, Echinopsis and Aster, while low hummocks of flowering Thyme are seen against the towering purple balls of Alliums. All are framed by the plumes of tall ornamental grasses. Using a mix of low and taller perennials and grasses provides a permeable boundary between the natural oasis of the roof terrace and its immediate urban context. Gustafson Porter + Bowman have to be congratulated for their skill, care and collaboration.